Anyone who knows me knows that I love contrarian thinking. I’ve learned that successful strategy is often counter-intuitive. When I was a financial advisor, I knew that when the masses were buying it was time to sell, and when they were selling it was time to buy. I also love experience and research, and really dislike opinions and anecdotes. While there’s always a great outlier story about how someone when above and beyond, and turned certain failure into huge success; I’ve learned that predictable and sustainable success comes from maximizing the probability of desired outcomes with your actions. That’s why when I heard that the Corporate Executive Board (CEB) was undertaking a major study into loyalty and customer satisfaction I eagerly awaited the findings. The CEB was the organization behind the study that led to the single best book I’ve ever read about successful selling, The Challenger Sale. I’m happy to say I wasn’t disappointed. 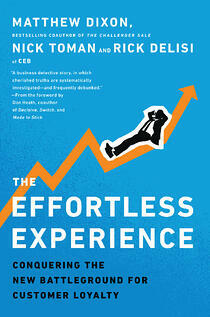 The new book The Effortless Experience, highlights the outcome of research of 97,000 customers to identify the real drivers of loyalty and satisfaction. While their findings are geared to the service side of your business, they are equally impactful to the sales side. The Effortless Experience uncovered four important themes that cause satisfaction. This is probably the most interesting and contrarian discovery. After all with all of the stories about Zappos, Nordstrom and Four Seasons service, who doesn’t want to delight their customers. While leaders clearly believe in the power of exceeding customer expectations in building customer loyalty, the data tells a different story. As we analyze responses from more than 97,000 customers, what we find is that there is virtually no difference at all between the loyalty of those customers whose expectations are exceeded and those whose expectations are simply met. Simply put, meeting customer expectations (not beating them) is the most effective thing you can do to grow your business and build loyalty. 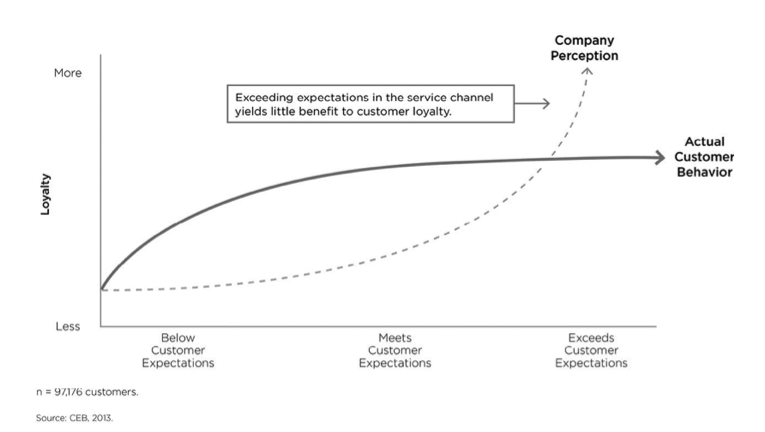 “Companies tend to massively overestimate the loyalty returns from exceeding customer expectations.” The study demonstrates that there is virtually no financial return for beating expectations. The study found that 20 percent of customers who reported they were satisfied also expressed that they were intending to leave the company and buy from somebody else at the same time they said they were satisfied. Additionally, 28 percent of those who said they were unsatisfied fully intended to stay loyal. “The harsh reality of the customer service world is that we tend to do more harm than good. To be precise, according to our research, any customer service interaction is four times more likely to drive disloyalty than to drive loyalty.” Think about that for a moment. No matter how much time you spend on your customer service efforts, the best touch is no touch at all. I think this is what really gets to the bottom line. The customer doesn’t want be delighted by you. As I shared eight years ago, what the customer wants is very simple; they want what they want, when they want it. Preferably without having to ask. This means that you need to make a promise and keep it. You do not need to exceed it. The study supports my experience that in the effort to exceed your promise, you’re more likely to increase the effort on the part of your customer and actually increase dissatisfaction and disloyalty. You have to make it easier to buy from you. This means you must be prospect centered in all things you do, not process or operationally focused. More and more the job of your sales team is to read your customer’s mind. The questions that are asked and the points that are made must be insightful and valuable from the beginning. More than ever sales organizations must focus their resources on those customer segments where they can create the most value. Further they must doe this at the expense of those where they cannot. These three steps are critical if your organization is going to systematically create the type of experience that will lead your prospect to make the changes you desire at the price your desire.